Ahead of the start of the world’s biggest technology trade fair, Hannover Messe 2019, Bosch has announced that it has made more than 1.5 billion euros with the implementation of Industry 4.0 applications, planning to generate annual sales of over a billion euros as early as 2022. “Industry 4.0 pays off. Digital and connected solutions are making factories more efficient, more flexible, and more productive,” said Bosch board of management member Rolf Najork, who is in charge of overseeing the business sector, in a media release. The company began implementing the connection between manufacturing and logistics back in 2012 and now confirms that the move has proven quite fruitful. Bosch relies on autonomous equipment and vehicles, robots, additive manufacturing, AI technology, and 5G mobile communications. “If you take the idea of the factory of the future to its logical conclusion, distinctions break down and you see that manufacturing and logistics have to be thought of as one element. This is the only way for Industry 4.0 to succeed in practice,” said Najork. According to Dr Stefan Aßmann, who heads up the Bosch Connected Industry business unit, intelligent software is the necessary element that it is needed to connect the three elements of success in the factory of the future: people, machines and data. “Industry 4.0 would be inconceivable without software. 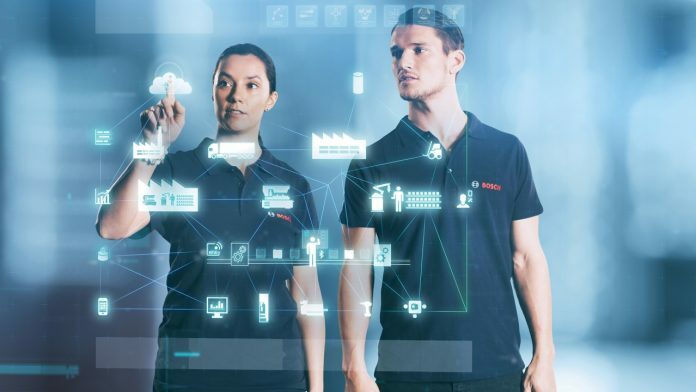 With our Bosch Connected Industry operating unit, we are further expanding our leading position in Industry 4.0 and pooling our software and services expertise under the name Nexeed,” said Dr Aßmann. As far as artificial intelligence is concerned, the company has opted for safe, robust and explainable AI technology that can be relied upon to relieve human workers of time consuming and difficult tasks. “Bosch regards AI as a key technology. Our goal is for all Bosch products to be equipped with AI, or for AI to have played a part in their development and manufacture, by the middle of the next decade,” said Najork. With 5G, the company has managed to boost reliability and minimize data transmission delays. Bosch will take part at the world’s leading technology trade fair, Hannover Messe 2019, where it will be presenting the advantages of using these technologies and the benefits of Industry 4.0 applications, such as the ActiveShuttle – the autonomous transport vehicle that carries materials from the warehouse to the precise spot on the production line, and ViPAS – an AI-based system for visual quality control, to name just a few. Hannover Messe 2019 kicks off today; for more information, click here. For more information on Bosch’s manufacturing solutions, click here.